The fall and a farm theme seem to go hand-in-hand here in the south. Maybe because it’s the time of the year when our corn mazes and pumpkin farms open up. Feeding farm animals and watching the chickens run around are one of my favorite parts of the corn mazes we visit. The truth is, I would own a whole bunch of chickens if I were allowed too! 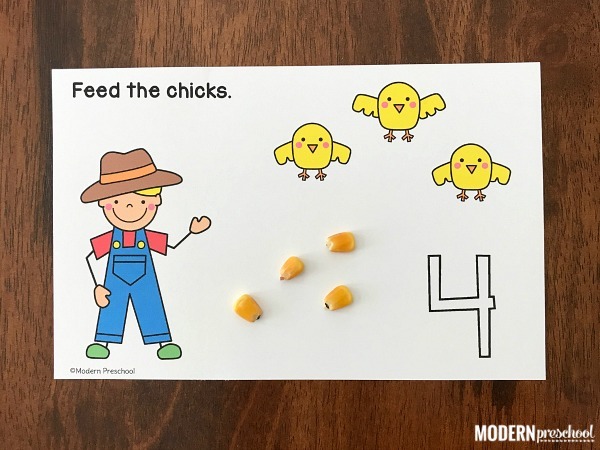 But for now, we are focusing on feeding the cute baby chicks with these simple farm counting mats. 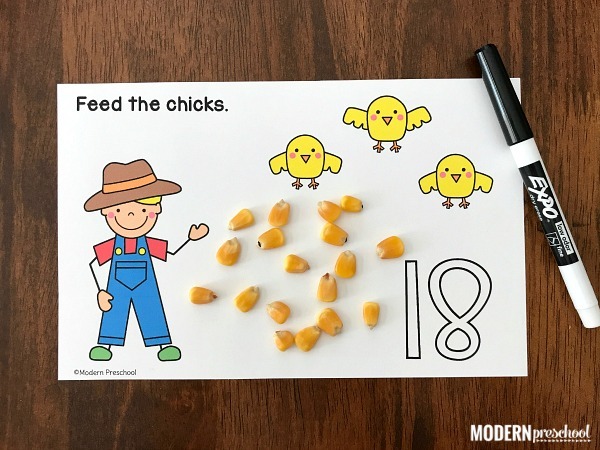 The free printable farm counting mats include the numbers 1-20. Simply print the numbers you are focusing on from the file below. I printed the numbers 1-12 for my pre-k kids to use this week. Our goal is to really master 1:1 correspondence on even smaller numbers. If you are going to laminate the the counting mats, you can print on regular computer paper. If you are not going to laminate or use a plastic page protector, print on cardstock for added durability. Cut the mats apart and place them in a basket with dried kernels of corn. I purchased a huge bag of deer corn from the feed store near me a couple of years ago. We have so much left still. It’s a great size for little hands! I am a huge fan of modeling our small group and table activities during circle time as a whole group. It’s a great time to over exaggerate non-examples and wrong answers. Be a little silly. Keep the kids engaged and excited about having their own turn to play and learn! If your set is laminated, take advantage of the number on the farm counting mats. Use a dry erase marker to trace the number and practice correct number formation. 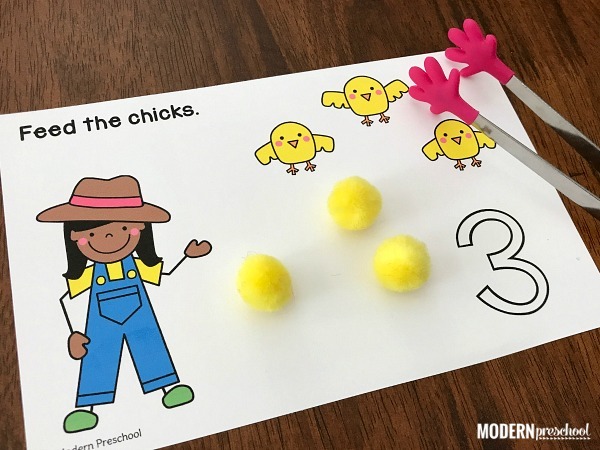 Add kid-friendly squeezers for extra fine motor skills strengthening too! Whenever there is an opportunity to add fine motor practice into an activity, I am all in. My little learners are all about the farm this week. Plan out your farm theme and include some of our other favorite farm activities! 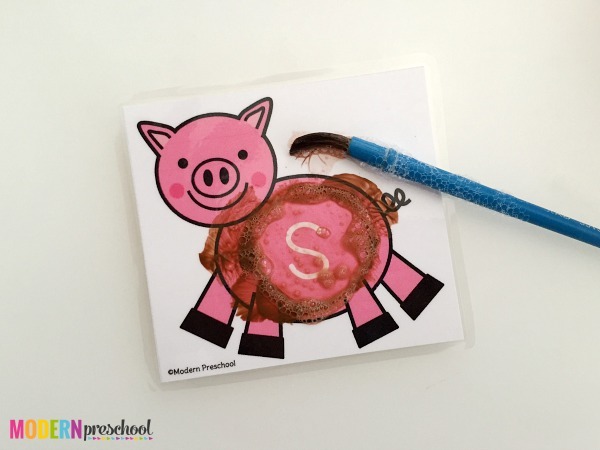 Say hello to the cutest little muddy pigs and practice letter recognition with our Clean the Muddy Pigs Alphabet Cards. 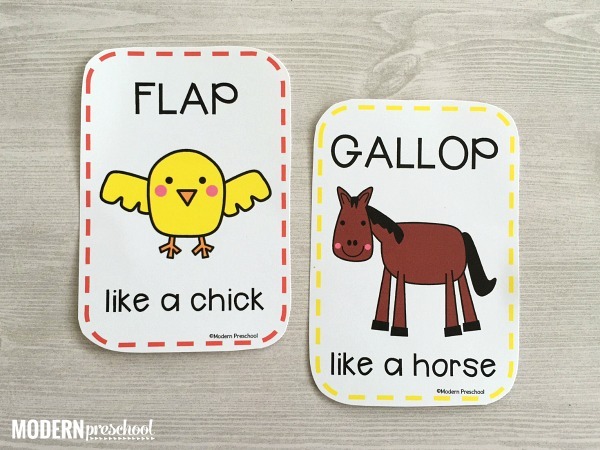 Get moving and learning with our Gross Motor Farm Game! 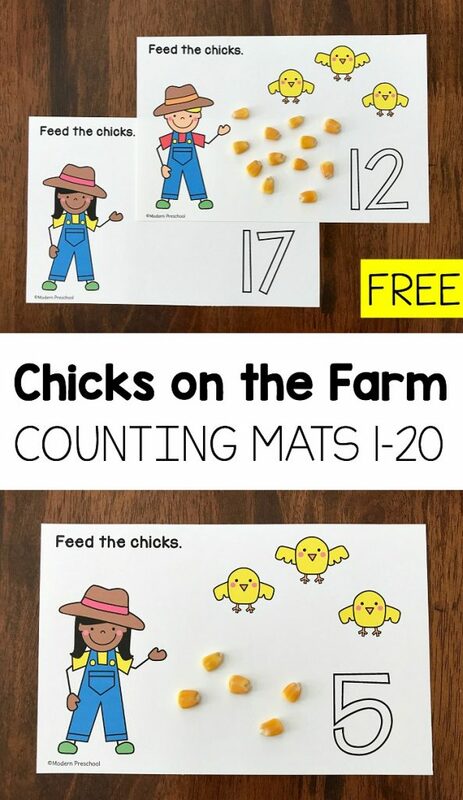 Now download your own copy of the farm counting mats and feed those hungry chicks! Thanks for this cute free printable and sharing your talent! Make sure your adobe reader is up to date so that pdf can open in the window! I would love to use your lovely feeding the chicks resource but when I enter my email into the subscription box, it doesn’t do anything! Any advice would be greatly appreciated! Thank you so much planned my months farm activities already 🙂 It’s refreshing to see different activities.